At the weekend, I finally sat down to give Rogue One a second viewing, having bought the DVD weeks ago but not really being in the mood for it up to now. Well, I have to say, I enjoyed it just as much this time around as I did back in December! The film actually feels like an expanded universe story, which I thought was a bit weird at first. When Lucas was at the helm of the franchise, he was always very careful with setting and location – I recall an article somewhere back when Attack of the Clones was shooting where this deliberate choice of worlds was discussed, though it’s really quite obvious across all six of his films. 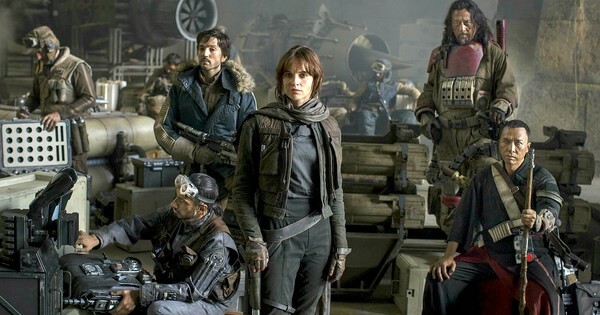 In Rogue One, however, we jump around from planet to planet with not so much a careless abandon, but certainly more an eye towards opening up the universe. While Geonosis and Tatooine are both desert worlds, they feel distinctly different because they’re meant to; Jedha (and Jakku, come to think of it) could basically be Tatooine by another name. This is something that the expanded universe did a lot, providing “just another x planet” and the like. I’m not laying this down as a criticism, of course, but more an observation. I love a lot of the old EU after all! While Scarif was a very interesting location to me, and I wouldn’t be averse to seeing more of it – both before and after the battle there – I think Jedha is by far the more interesting of all the locations we’ve seen so far. I’ve talked about how I feel Disney may be on the verge of declaring the Prequels non-canon before, but I do get a sense that, to show more of Jedha, we’d need to tread on some fairly rocky ground. The location of a Jedi temple there seems to run counter to what we know of the Order from the Prequels – indeed, the fact that there is a buried-treasure-trail of such temples as per The Force Awakens also reinforces this point. But I find it incredibly interesting that such a thing could be, and really want to know more of what was actually involved there. Was it more of a Jedi outpost? Was the Church of the Force a Thing during the Prequel era? Jedi seemed to be nothing more than an elite police force back then, so what would prompt people to worship them, and what was the attitude of Mace Windu et al to this veneration? Or does the Church of the Force not so much worship the Jedi themselves as the idea of the Force, in which case what did they think of the Jedi as people? I so desperately want to know more about this stuff, so I really hope we get these answers! There is what I think a young adult novel coming out in the next couple of weeks, Guardians of the Whills, which features Chirrut and Baze between their time as Guardians and the arrival of Jyn and Cassian, so hopefully we’ll get some more information from that! Speaking of Cassian Andor, I mentioned this back in December, but I’m even more curious as to this guy’s back story now. He’s apparently the head of Alliance Intelligence, though having watched the film again, I got the impression he was more a sort of go-to guy to get the Alliance’s dirty work done. This seems to be the feeling from his orders from General Draven, and I quite like the idea that he is more of a mercenary sort. I believe he’s in the other upcoming YA novel, Rebel Rising, which I also have on preorder, so it’ll be interesting to learn more about this guy. This is already turning into a rambling blog (my specialty), so I’ll wrap it up here. Suffice it to say, I thought the film was just as good the second time around, and even though parts of it were a bit too on-the-nose, I found myself just wrapped up in the magic of it all and enjoying the ride! Interestingly, the CGI Tarkin didn’t seem to be as good this time around, while the CGI Leia looked a lot better on the smaller screen. I actually started to watch A New Hope immediately after, but actually didn’t see the point after the droids launched in the escape pod. I thought it was interesting because so many people talked about watching them back-to-back in this manner when it was released, as if one would greatly enhance the other, but I actually found that Rogue One, while leading immediately into A New Hope, is self-contained enough that it doesn’t actually demand such a marathon. While this is probably due to the fact that I know A New Hope like the back of my hand, and can thus fill in the entire film from memory, I thought it worth pointing out that, in my view, nothing is gained from watching them both like that. Anyway! Great film, definitely worth its place in the series. Oh, absolutely! While I’ve been a bit underwhelmed by the new novels and comics, I’m really enjoying the new films, can’t wait for more!! Next Next post: Assault on Hoth!